S.N. 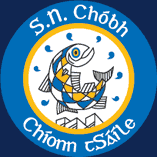 Chóbh Chionn tSáile operates a parent/teacher meeting policy which was voted in by the parents and adopted by the Board of Management. We recognise that communication is of vital importance in developing and nurturing co-operation between home and school. In our school, communication between parents and teachers takes place by way of annual parent/teacher meetings. school calendar is issued to each family at beginning of new school year.